Dr. Smith's ECG Blog: Giant R-waves. What are they? 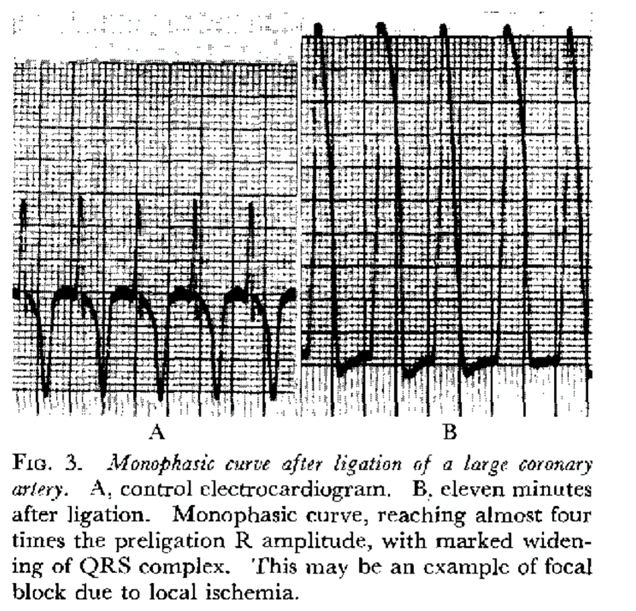 Giant R-waves. What are they? An elderly patient was brought in by EMS from a nursing home, after having been intubated for hypoxic respiratory failure. Transport was notable for an episode of VF that responded to CPR and defibrillation. In the ED, the patient was persistently hypoxic, with significant hemodynamic instability in the ED and several episodes of PEA, hypotension, and 2 defibrillations for VF/VT. The team was concerned for hyperkalemia, given the apparently wide QRS. Thus, Calcium, sodium bicarb, insulin, and dextrose were given. However, the QRS did not change after this therapy. Why did we mistake the initial ECG for hyperkalemia? A full discussion of diagnostic/cognitive biases is best left to others with more insight, but there are, I think, a few specific issues. Probable answer: the dramatic combination of “spikey complexes” an apparently wide QRS, and a sine wave appearance. A wide QRS absolutely should prompt consideration of hyperkalemia, and empiric treatment is warranted if there are signs of hyperkalemia on the ECG. However: The QRS isn’t nearly as wide as it appears. There is a right bundle branch block (RBBB) and left anterior fascicular block (LAFB), but what appears to be make it an even wider QRS is actually ST segment. How wide is the QRS? Whenever there is RBBB, one should find the lead where you can see the end of the QRS. Then you can measure the QRS duration, and see the end of the QRS in every lead. Here, the end can easily be seen in leads V1 and II. Before we do that, what is the rhythm? There do not appear to be P-waves. Thus, this is either junctional rhythm with RBBB and LAFB, or it is a left posterior fascicular escape. The red line represents the end of the QRS in V1 and II. We can find the same point on lead II across the bottom, then draw the lines up so that we find the end of the QRS in every lead. Now you can see that the complex beyond the end of the QRS is ST Segment, hugely elevated. At this point, STEMI was considered. 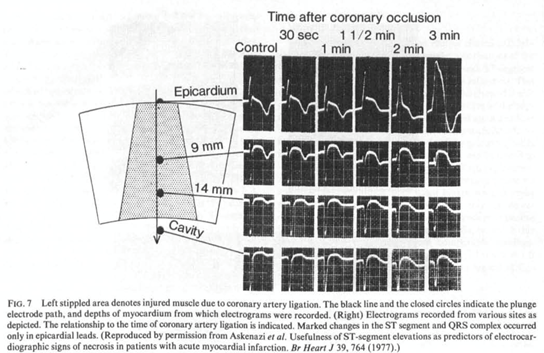 A bedside echo was obtained (and repeated when the interventionalist arrived). The images were limited to poor windows, but did not clearly demonstrate large regional wall motion abnormalities. Nonetheless, cardiology immediately agreed to cath lab activation. What is the interesting finding? It may be better seen in the next ECG. This is accelerated idioventricular rhythm (AIVR), which is a common reperfusion arrhythmia. It is a very good sign. It can be mistaken for VT, but VT is fast and AIVR is not. (There are inverted P-waves in front of the QRS which I find difficult to explain. Are they isorhythmic low atrial P-waves? If there were persistent STEMI superimposed on this AIVR, it would look like LBBB with STEMI (concordance or proportionally excessive discordance). There is none here, which also indicates spontaneous reperfusion. In other words the ST elevation has resolved and this indicates that the artery is now open. Angiography demonstrated a 95% thrombotic lesion in the proximal LAD. The patient did well after PCI. The potassium level was 5.4. --Hyperkalemia, of course, causes narrow, spiked upright T-waves (although not invariably). The T-waves in this ECG, however, are wide, and either inverted (V1-V5), or blunted. --There is indeed a sine-wave type of pattern here, but it is arguably “backwards” from the typical hyperkalemia pattern. In hyperkalemia, a wide, blunt, inverted QRS is often followed by a sharp, narrow, upright T-wave (example from a prior post). By contrast, our ECG showed a sharp, upright QRS, followed by a blunt, inverted T-wave. A dramatic and unusual “shark-fin” morphology of the anterior QRS complexes distracts us from the other leads. The anterior QRS/T complexes tower over those in the lateral leads (I, aVL, V6), distracting us from those more typical findings of STEMI. A diagnostic pattern of STEMI is seen, but mostly in the perennially under-appreciated lateral leads. The dramatic and unusual anterior T-wave inversions also distracts us. Most T-waves in anterior STEMI without any reperfusion are upright. So what accounts for the unusual QRS/T morphology? It is extreme ST elevation, and has been referred to as "Giant R-waves." The towering “shark-fin” anterior STEMI is unusual, but not rare. A few cases can be seen on the internet (from Jason Winter’s ECG blog, from a British paramedic blog, and from the Wave-Maven site. ) Dr. Wang has a very similar example from his recently published book. This QRS/T morphology is also known as the “giant R-wave” pattern of STEMI. For example, Madias reported on an elderly male who presented with chest pain, and an ECG strikingly similar to our patient.1 This pattern was transient, and resolved within 30 minutes. Catheterization was not performed, but anterior MI was diagnosed based on enzymes and development of anterior Q-waves. 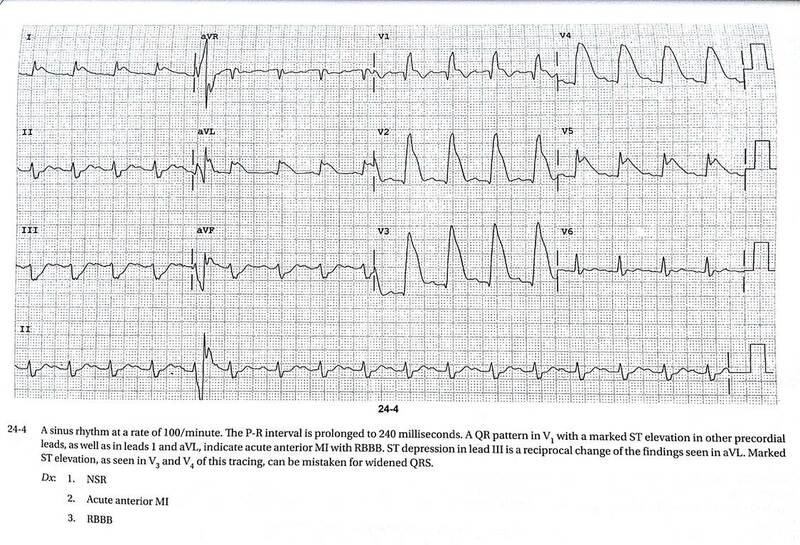 He noted that this pattern was usually found very soon after onset of ischemic symptoms or defibrillation, and rapidly evolved to more “typical” ischemic patterns soon after. 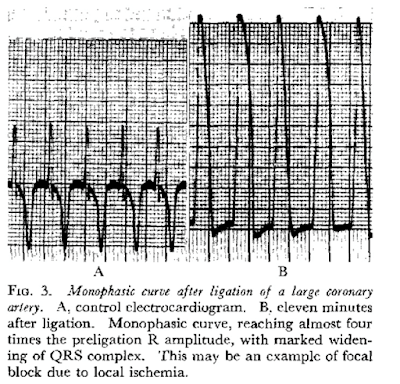 The anterior T-wave inversion – spontaneous reperfusion? It is worth noting that inverted T waves are not a universally reported feature of giant R-waves. In our case, the inverted T wave may have indicated that our patient was spontaneously reperfusing. Our interventionalist found a subtotal occlusion, with fresh distal embolic debris, suggesting partial spontaneous recanalization. Also, as indicated, the ECG performed just before leaving the ED shows not only the resolution of ST-segment elevation, but also AIVR, a rhythm often seen in the context of reperfusion of a STEMI. 1. Madias JE. 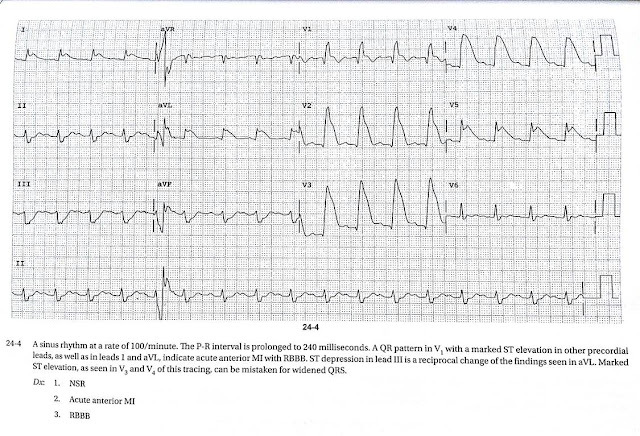 The “giant R waves” ECG pattern of hyperacute phase of myocardial infarction: A case report. J Electrocardiol. 1993;26(1):77-82. doi:10.1016/0022-0736(93)90068-O. 2. Madias JE, Krikelis EN. Transient giant R waves in the early phase of acute myocardial infarction: Association with ventricular fibrillation. Clin Cardiol. 1981;4(6):339-349. doi:10.1002/clc.4960040606. 3. Ekmekci A, Toyoshima H, Kwoczynski JK, Nagaya T, Prinzmetal M. Angina pectoris: V. Giant R and receding S wave in myocardial ischemia and certain nonischemic conditions. Am J Cardiol. 1961;7(4):521-532. doi:10.1016/0002-9149(61)90510-0. Spectacular case. What about the rhythm on the first ECG? I'm not sure I see P waves. Maybe right after the T wave in aVL with a very long PR? It could be. Alternatively, there might be AIVR here too. With a left posterior fascicular escape. GREAT case Steve/Brooks! Agree that the rhythm in the initial tracing is likely to be posterior fascicle escape. QRS morphology shows RBBB/LAHB and not nearly as wide as was initially thought — with to me lead V6 being a KEY CLUE that ST elevation is the real problem — with those deceptive but truly giant R waves in other chest leads. THANKS for presenting! Is a run of non-sustained VT the common pattern phenomenon preceding/leading to an AIVR (Similar to a downshifting maneuver in car manual transmission to make an automobile comparison) or is it directly correlated to the dynamic changes occuring in the opening of the artery ? I mean, would the VT go the sustained route if the artery wasn't open enough ? Olivier, I do not think so. In fact there may already be AIVR of a different morphology on the first ECG. Why not to consider ST-segment depression V2, V3 ,Sgarbossa B criteria in the AIVR ? Sgarbossa applies to left bundle branch block, not right bundle branch block. I mean fourth ECG in this case , Which shows AIVR with Heart rate 75 , does its look like LBBB with ST depression in V2,V3 ? I see what you mean. It looks like LBBB because it is AIVR. There is some minimal concordant ST depression in V2 and V3, which if it were LBBB would be suspicious for posterior MI. Does Sgarbossa apply to AIVR? Probably. In this case, we know the LAD and anterior wall are the culprit and so, if this does signify ischemia, it is probably residual subendocardial ischemia of the anterior wall. Diffuse ST Elevation and Chest Pain, What is it?